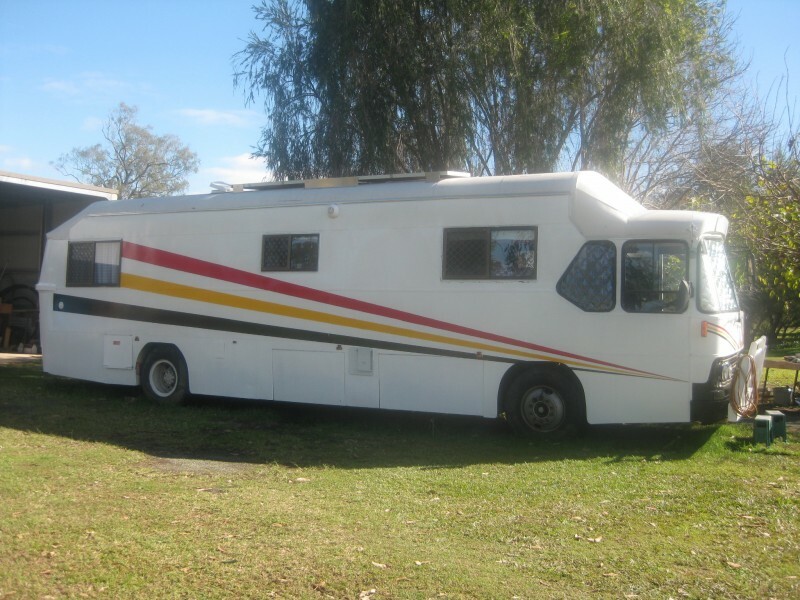 "WEEROONA (Resting Place)" is owned by Frank and Jennifer Wilmink from Maroochydore Queensland is our homebase..
A 1979 Mid Mount Volvo bus, 5 speed manual. 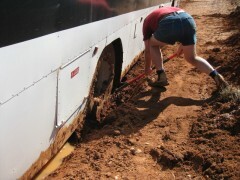 We purchased the bus about 2003 knowing that it needed to be rid of cancer. We immediately removed the skins and replaced all the upper framework and resheeted it. It then became our "removal truck" as we spent the next 5 years housesitting in SE Qld. I then decided to lift the roof by 300 mils and start construction. A total of 15 months was needed to complete the fit out. My only outside help was using tradesman for 240 volt power, auto-electrics, solar power, gas fitting and cabinets. I then built a trailer to take the Toyota Surf and 3.7 met boat with its own trailer. I thoroughly enjoyed the experience of building my own motorhome and would love to do another one some time in the future. I used 4 x 175 watt solar panels on the roof to 4 110AH batteries and a 3500 watt inverter.All lights in the bus are 12 volt, the fridge is an Evacool 12 volt 210 lt, 1/3 freezer 2/3 fridge. I use a 12 volt circulating fan at the back of the fridge to bring cooler air over the back and also use a small 12v circulating fan inside the fridge to move cool air around inside. I am a Vietnam Vet, in my early 60s, my (first) wife of 41 years was a mother and Nurse.We commenced travelling in Jan 2011 and have only seen a little of Aussie so far. We have a Son in Maroochydore (our home base), A Son in Lithgow, and a Daughter in Melbourne. Have those spread apart so, we use them as 'must sees' each year. We are presently in Perth and will be touring the SW area in 2014. Because of our size ( 18.5 m long) we have only used caravan parks 5 times since starting our travels. Our aim is to see this vast country of ours and to assist aussie farmers to have a break ie farm-sit. We often arrive in town and ask the question "is there a farmer that needs a hand" as I am a Jack-of all and Jennifer can cook anything. That often opens many a door and we love it besides we make great friends. On the back of our 4WD I have put the word...VIAGRA which is ...Veterans Ignoring Ageing Going Round Australia. It has been photographed many times by fellow travellers and I get many "toots" from passers by. So if you see us on the road give us a toot.